Cat’s R1700 XE is the company’s first battery electric underground LHD. PEORIA, Ill. – Caterpillar has chosen to make the new R1700 underground mining loader its first battery electric LHD platform. The design of the new battery electric Cat R1700 XE will use advanced technology for lithium-ion batteries and fast, onboard charging to advance safety and promote high production. The Cat R1700 was introduced in 2018 as a completely new design focused on major productivity improvements for the size class. 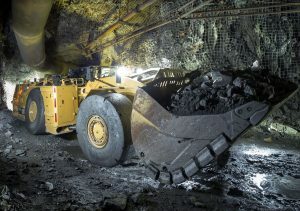 These improvements primarily come from its efficient electro-hydraulic system, which saves fuel and provides greater loader forces, leading to significantly improved digging performance in the pile. The R1700 XE will combine these new features with a lithium-ion battery operating and charging system developed by Caterpillar. The exclusive MEC 500 fast charging system allows rapid, onboard battery charging with little or no impact to the mine’s existing electrical infrastructure. The Cat charging system eliminates both the hazards of battery handling during recharging and the necessity to maintain change-out battery inventories. In designing the R1700 XE, Caterpillar is relying on a wealth of experience in designing electrified machines and power generation components and solutions. These include more than 350 patents granted during design of machines such as the electric drive D7E and D6 XE crawler dozers, 988K XE wheel loader, and 794 AC and 795F AC mining trucks. The R1700 XE program also uses components from the Cat Microgrid solution. For underground mining specifically, this electrification experience was reinforced by the development of a proof of concept machine. Caterpillar converted a conventional diesel Cat LHD into a battery electric platform. Concurrent to this program, the new MEC 500 charging system was tested. Both the loader and charging system saw substantial testing at Caterpillar’s Peoria proving grounds, and that was followed by weeks of operation and testing at a customer’s mine in Canada. Compared with baseline numbers for a diesel powered R1300 LHD, the battery powered model exhibited more than a tenfold decrease in total energy costs; nearly eight times less heat generated; significantly less noise at the operator’s ear; immediate torque availability from the electric motors; reduced dust levels attributed to not having a conventional diesel engine radiator fan; and reduced tire wear. Caterpillar has used the insight gained from its proof of concept testing to develop the R1700 XE and the MEC 500 charging system as a safe and productive option for mines going to battery electric fleets. Readers may send their questions and requests to www.Cat.com/requestCatinfo.